This is, without a doubt, one of my favorite films of all time! I'll never forget watching this film for the first time with a good buddy of mine, afterward we couldn't stop talking about it and spent a great deal of time explaining plot points to each other. We finally decided that we just had to see it again, so we did and all of our questions were answered and our theories proven correct. The story is nothing less than superb! Every time you think you have the movie figured out they throw you for another loop, but not too much as to get you irritated trying to figure out the plot. This is most definitely a film that deserves at least two viewings before you can truly understand and appreciate the story. The characters are all excellent as well, although I was sad to see Jack Harmen (Emilio Estevez) get killed off so quickly, I liked his character. The cast is extraordinary! 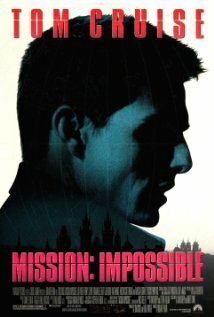 Tom Cruise plays Ethan Hunt perfectly! Jon Voight was the perfect choice for Jim Phelps. Emmanuelle Beart was very good in her role. Henry Czerny was superb as Kittridge. Jean Reno was an excellent addition to the cast. Ving Rhames was a very nice touch and really added a lot to the film. Kristin Scott Thomas was lovely as always, although played a somewhat minor role in the greater scheme of things. Vanessa Redgrave was another nice addition to the cast. And finally, Emilio Estevez (as I mentioned above), played a small role, and played it quite well. I can see why some of the big fans of the show wouldn't like this film due to certain plot points that I can't give away, so if you are a big fan of the show, be forewarned, you may have some issues with the film. Personally, I've never seen a single episode of the old television show, so I had absolutely no frame of reference. Which, I believe, put me in a better position to appreciate the story. I feel that I have to mention the action scenes in this film! SPECTACULAR!!! The scene where Kittridge and Hunt are talking in the restaurant...just AWESOME! The entire last 20 minutes of the film...UNBELIEVABLE!!! The filming, the action, the special effects and stunts alone make this film worth watching (but luckily, there is so much more to appreciate).